Gluten-Free Diet for Osteoporosis? If You Have Osteoporosis, You May Have Celiac Disease and Not Know It! If you have osteoporosis, your chances of having celiac are much higher. Reduced bone mineral density is frequently found in individuals with celiac disease. 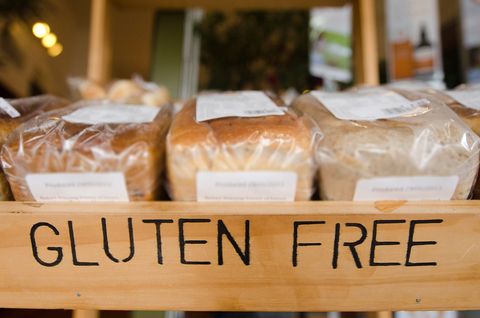 In the West, one out of every 100 people has celiac disease. But if you have osteoporosis, your chances of having celiac are much higher. The problem is, most people with celiac disease have never been diagnosed and don’t even know they have it. Osteoporosis is often undiagnosed and untreated, too. That leaves people unaware that they should be following a gluten-free diet for osteoporosis and celiac disease treatment. If they knew to stop eating gluten, both the celiac disease and the osteoporosis could be reversed. Doctors have known for some time that reduced bone mineral density is frequently found in individuals with celiac disease. Up to 70% of adults with celiac disease have bone mineral density low enough to be diagnosed as osteopenia, and the rates of full-fledged osteoporosis in those with celiac disease are also very high. In fact, osteoporosis is one of the primary complications associated with celiac disease. In a recent study on long-term fracture risk, celiac disease was linked to an increased fracture risk before and after diagnosis. In fact, most fractures occur before the diagnosis of celiac disease is ever made. Osteoporosis and easily broken bones are actually some of the most common reasons celiac disease gets discovered and diagnosed in adult men and women. While it’s true that more people with celiac disease have osteoporosis, it’s also true that more people with osteoporosis are found to have celiac disease. Because the rates of celiac disease in people with osteoporosis is so high, many experts recommend screening all patients with osteoporosis for celiac disease and starting a gluten-free diet for osteoporosis right away in those positive for celiac disease. Dr. William Stenson of the Washington University School of Medicine in St. Louis, MO, and colleagues published a study in the Archives of Internal Medicine (now called JAMA Internal Medicine) which showed a much higher prevalence of celiac disease among osteoporosis patients. He and the other investigators evaluated 840 individuals both with and without osteoporosis by screening them with the blood tests commonly used to diagnose celiac disease— anti-tissue transglutaminase and antiendomysial antibodies. Those with positive blood tests then underwent biopsies of their intestines to confirm the diagnosis of celiac disease. Subjects with biopsy-proven celiac disease were treated with a gluten-free diet for osteoporosis and then their bone mineral density was re-checked. Results showed the prevalence of biopsy-proven celiac disease was “much higher” at 3.4% among those with osteoporosis compared to only 0.2% among those without osteoporosis. The anti-tissue transglutaminase levels in the blood correlated with the severity of osteoporosis as measured by DEXA scores, demonstrating that the more severe the celiac disease the more severe the resulting osteoporosis. Treatment of the patients with celiac disease with a gluten-free diet resulted in marked improvement in bone density as measured by DEXA. “The prevalence of celiac disease in osteoporosis is high enough to justify a recommendation for screening of all patients with osteoporosis for celiac disease,” Dr. Stenson and his colleagues concluded. Why does celiac disease cause osteoporosis? The reason celiac disease causes osteoporosis is thought to involve a number of factors. Impaired absorption of calcium and vitamin D are thought to play a role, since celiac disease causes poor absorption of many different nutrients. Celiac patients also have abnormal inflammation with excessive levels of pro-inflammatory compounds in the blood which are also believed to play an active role in causing bone loss in celiac disease. What is an optimal supplementation plan and diet for osteoporosis? A gluten-free diet for osteoporosis is the most important treatment for protecting yourself from fractures related to osteoporosis caused by celiac disease. But most experts believe it takes more than just a gluten-free diet for osteoporosis reversal in those with celiac disease. An optimal diet for osteoporosis is also one that is nutrient dense, anti-inflammatory, and alkalinizing. In addition to eating this type of optimal diet for osteoporosis, most experts also believe supplementation with additional nutrients is also necessary. Testing for and treating vitamin D deficiency, for instance, is crucial, and regular supplementation with calcium, vitamin D, vitamin C, magnesium, boron, and other bone-related nutrients is often recommended. Am J Gastroenterol. 2001 Jan;96(1):112-9.
a gluten free diet, anti inflammatory, bone, bone density, bone density results, bone loss, bone mineral density, boron, calcium, celiac, celiac disease, celiac disease causes, celiac disease treatment, diet, diet for osteoporosis, for osteoporosis, gluten, gluten free, gluten free diet, inflammation, magnesium, nutrients, osteopenia, osteoporosis, osteoporosis is, osteoporosis reversal, osteoporosis treatment, vitamin, vitamin c, vitamin d, vitamin d deficiency. Celiac Osteoporosis and B cell lymphoma. Will you pls send references connecting them. I thought you might be interested in this article on https://universityhealthnews.com: Gluten-Free Diet for Osteoporosis? If You Have Osteoporosis, You May Have Celiac Disease and Not Know It!